Richmond Atkinson on Are deer the new moa: Ecosystem re-wilding or a flight of fancy? Nic Rawlence on Are deer the new moa: Ecosystem re-wilding or a flight of fancy? In an unassuming building at the top of Tory Street in Wellington lies buried treasure: the remains of a lost world that rivals Smaug’s hoard, but the equivalent of the five armies is closing in. The proposed restructure of our national museum means we are in danger of losing the key to unlocking the secrets these biological taonga hold. I meet Alan Tennyson, the Curator of Vertebrates, at Te Papa’s offsite collections facility. This home away from home holds a special place for me as a self-confessed fossil nerd. I owe my career and my lab’s research programme to the treasures housed in its basement and those of other New Zealand museums. I have been visiting Te Papa’s collections for nearly 15 years, working on everything from birds to seals, from cetaceans, (whales and dolphins), and reptiles to frogs, many of which will never be displayed to the public. The success of some of the biggest high-profile fossil bird research projects in recent years, (such as elephant birds and giant penguins), has been down to the perseverance of curators and collection managers at Te Papa. These seminal publications showed kiwi (Apteryx spp.) 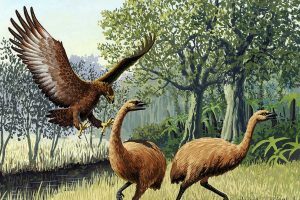 are most closely related to the extinct giant elephant birds from Madagascar (not a bunch of feathered Aussies) and that New Zealand once had the largest penguins in the world. Trudging down a winding flight of stairs, my footsteps echo in the gloom as we go ever deeper under the streets of Wellington. Beneath the oblivious city above is the treasure trove, the hidden part of Te Papa. Opening the doors to one cavernous room, I take in my surroundings. It’s like meeting old friends. Here lie the ghostly, skeletal remains of New Zealand’s unique biodiversity: the musky, oily smell of whale bones; rows of shelves labelled with the scientific names of our lost avian forebears; and boxes upon boxes of bird bones, some tens of thousands of years old and as rare as hen’s teeth. In another room, I’m met with rows of cabinets (and the ever-present and strangely comforting smell of camphor) containing ancient bird skins, their beautifully coloured, feather cloaks just waiting, if given half the chance, to fly off at the end of the day. Type specimens (those that own the scientific name of a species) hold regal court over their subjects. Still more rooms contain the remains of hundreds of prehistoric compost heaps, looked after by the ever helpful collections manager Carolyn McGill. They give us an unprecedented glimpse into the diet and behaviour of Māori through time. 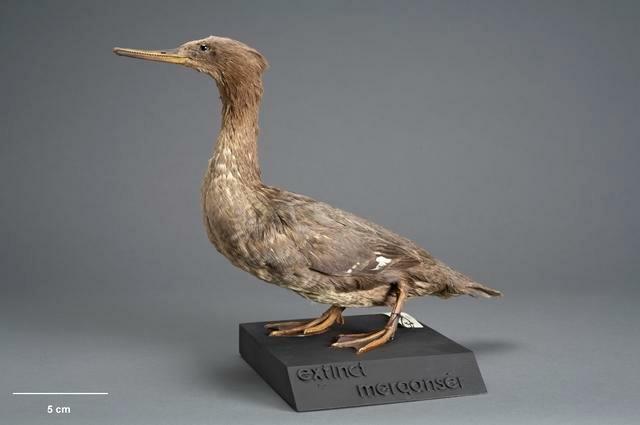 Priceless treasures: Te Papa holds a vast hoard of taonga including an ancient skin of the extinct Merganser (Mergus spp.) that once occurred across New Zealand. The collections and facilities at Te Papa are internationally considered world class, rivalling many of the best museums in Europe and North America. They are constantly being added to by research scientists: the Miocene Wonderland of Saint Bathans and Martinborough’s Cave of Bones are a few such examples. If it had not been for the foresight of curators like Alan and the collections managers keeping boxes of unidentifiable bone fragments, our latest paper on ‘bone grab DNA’, published in the prestigious international journal PNAS, would not have been possible. Among the gems hiding out in these ‘frag bags’, this fossil lucky dip showed Kākāpo (Strigops habroptilus) lost a significant amount of genetic diversity after human arrival in New Zealand, and that Māori feasted on a wide range of whales and dolphins. Many of my other scientific excursions into New Zealand’s lost world have been greatly helped by Te Papa’s extensive collections of Australian Black Swans and Otago Shags that have been amassed over the past couple of decades. Time travels at a different pace down here in the caverns beneath Tory Street. Over the next week, Alan and I will sample numerous fossil bones for ancient DNA analysis, characterise the shape and osteology (the bumps on bones) of our enigmatic avian fauna, and plot our next research projects, often working across multiple different collections. You never know what you are going to find walking up and down the aisles of the collections; indeed, there are numerous examples of new species that have been discovered this way. Meanwhile, Tom Schutz, one of the most helpful and knowledgeable collections managers I know, brings me an increasingly varied smorgasbord of bird tissues for genetic analysis and efficiently organises my short-term loans of delicate wren, skink and gecko fossils for analysis in my lab. Te Papa’s collections, spanning millions of years of New Zealand’s evolutionary history, have been amassed since the mid-19th Century and are vital to answering many of the big picture scientific questions concerning New Zealand; questions like how did the composition of our unique biota come to be; what was the impact of climate change and humans; and how can we use this knowledge to save what’s left, or in some cases, turn back the clock? The devil is in the detail: Scientists come from all over the world to work on the internationally renowned collections at Te Papa. Photo courtesy of Luke Easton. But all this, including the conservation management of this natural hoard and the ability of scientists and museum staff to access it, to tease out the biological secrets that it holds, is in danger. Te Papa is undergoing yet another restructure, the third in as many years. Up to six collection managers’ jobs, including Carolyn’s and Tom’s, could be lost. If that happens, Te Papa collections will be firmly on the critically endangered list. Collections are not just dusty boxes full of bones, brought out once in a blue moon to show off to the public like circus freaks. They are a living, breathing entity, that includes curators, collection managers and conservators, not to mention all the institutional knowledge that comes with these professionals. Each and every specimen (there are literally millions of them in Te Papa) also has its own story to tell, from the whakapapa and biological heritage preserved in bones or feathers, to the scientific history of collectors, curators and researchers who have worked on them. Ask any of the curators a question and the information in their minds is another buried treasure; their experience is the map that can unlock biological nuggets of gold. One only has to look at the visitors’ book to see how many researchers from around the world visit these collections every year. When it comes to scientific endeavour, the devil is in the detail. I can still remember seeing the fossil iguanodon tooth, one of the first dinosaur fossils ever found, that Gideon Mantell or his wife Mary Ann discovered in 1822. That fossil sparked the era of dinosaur hunting! Housed in an unassuming box, under the care of Carolyn, the sheer amount of history emanating from this fossil metaphorically brought me that much closer to some of the early pioneers of palaeontology. A Rosetta stone to a lost world: Te Papa’s collections have been pivotal in helping reconstruct how New Zealand’s pre-human ecosystem functioned. However, Te Papa’s latest restructure may see collection managers cut from 16 to 10 across its vast and varied treasure trove, including Art, History, Māori, Pacific and Natural History. That’s one seriously overstretched frontline indeed. There have already been significant cuts in the previous restructures. This further reduction is the equivalent of getting rid of most of the Fellowship in Lord of the Rings: without the dwarf, elf, a kickass Aragorn and Gandalf’s knowledge about the “one ring to rule them all”, Middle Earth would be screwed. To be fair, this drive to reduce collection staff is not unique to Te Papa, but is a symptom of a larger malaise that has crept through the museum world over the past 20 years. There has been a widespread underinvestment in collections, especially natural history ones, and their conservation. Much like Sauron, the malice is seeping everywhere. Already understaffed, the situation is only going to get worse. Maintaining a record of our history and conserving specimens is becoming like a war of attrition: if you don’t have frontline troops to keep back the enemy, you have no one to wage war on the elements of time or the odd, absent-minded researcher. The archaeozoology (containing the biological remains from prehistoric compost heaps) and the mollusc (shells and snails) treasure troves have only Carolyn and collections manager, Bruce Marshall, keeping back the ravages of time. As Trevor Worthy says, “a collection needs a collection manager who has knowledge. They need the knowledge so as by glancing at a specimen they know what it is and what its intrinsic worth is”. Carolyn and Bruce are now in the firing line. Lose them, and you lose much of the knowledge associated with those collections, placing them in danger. In the firing line: Andrew Stewart, a fish expert and co-author of the Fishes of New Zealand, may be out of a job if Te Papa proceeds with its restructure of collections managers. 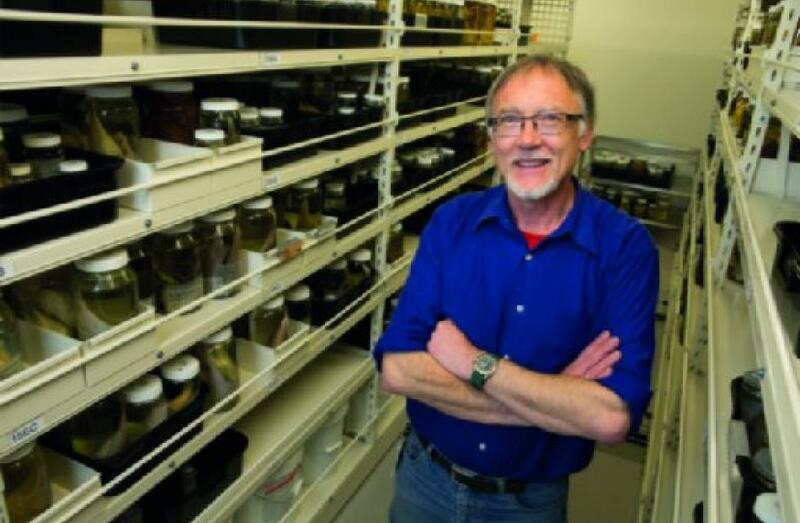 Internationally respected, highly qualified and prolific, Bruce is a key collaborator on an ambitious project my lab is undertaking, looking to increase the number and breadth of mollusc specimens we can get ancient DNA from. If we can achieve this, it unlocks a whole new toolkit to reconstruct lost worlds. As one of New Zealand’s top mollusc researchers, the loss of Bruce would be sore indeed, like Elrond leaving the shores of Middle Earth at the conclusion of The Lord of the Rings, leaving our project teetering on a cliff. This underinvestment in collections staff is only the tip of the iceberg. Te Papa’s marine mammal collection, one of the best in the world, has been rudderless since the last restructure with the loss of Anton van Helden, and is in danger of being “beached as bro”. Without an expert curator and ongoing collections development, I can’t see this taonga being re-floated any time soon. “A collection becomes static and dies if it is not used. To be used, it should be a continuing repository”, says Trevor. The archaeozoology collection is already in a similar boat; when highly regarded archaeologists Janet Davidson and Foss Leach retired several years ago, their shoes were never filled. If Carolyn goes, where will that collection be left? Te Papa is part of a network of museums and institutions throughout Aotearoa conserving our biological heritage, at the behest of government and the Department of Conservation. Adding insult to injury, the restructure proposal may see the collections further split up: the five armies are waiting to take their share of the booty. NIWA may inherit the fish collection and move it to their Greta Point facility, not just an earthquake hotspot but also a tsunami one. (Cue face palm.) The rest, including many of my old friends amongst the collections, may be sent to Te Papa Manakau, under the pretence of earthquake protection and increasing accessibility of the collections. Ironic really, because moving them to Auckland will decrease accessibility to scientists and put them in an active volcanic zone instead. Shifting the collections north of the Bombay Hills would put our precious and irreplaceable Faberge eggs in one basket, considering the significant number of major collections already in the City of Sails. Personally, I’m not even sure whether all the taonga would survive the trip. Moving the collections to Te Papa Manakau would also divorce them from their passionate carers and all that institutional knowledge. It’s the museum equivalent of Donald Trump’s recent child separation policy; how many Wellington-based museum staff will be happy to uproot their families to move to Auckland, much less buy a house in the over-inflated Auckland property market? The thing is Te Papa’s Tory Street facility is built like a bomb shelter; it is one of the safest buildings in Wellington in an earthquake. In addition, being centrally located in New Zealand, it is accessible to all New Zealanders. The cost of carving up our national jewel and distributing its priceless treasures to other institutions could be better invested back into collections management and development. Te Papa now risks irrelevance, at a time when there is skyrocketing interest in New Zealand’s natural history, unless it embraces its collections. Rather than being overstaffed, the stark reality is Te Papa’s collections team is horribly understaffed and desperately needs specialised collections managers and curators. It’s not too late to save the Fellowship. When the dust settles on this post-apocalyptic world, what’s to stop Te Papa’s chief executive Geraint Martin further reviewing curatorial positions? When and where will it end? If the aim of the restructure is to place Te Papa and its collections on the critically endangered list, then it will have succeeded. The collections really will be dusty boxes full of museum curiosities. If the restructure is not about money, as Martin has stated, one could argue that Te Papa is failing in its core role as a museum (to conserve and research its collections, and communicate that to the public), which begs the questions: what is the new post restructure philosophy; is Te Papa a collections-based research museum or a public fun park; and is it time to have a dedicated research-focused New Zealand Museum of Natural History. The Brits and Americans have successfully created specialist museums to popular acclaim, so why not us Kiwis? It’s the end of my contented week in the basement, catching up with long lost friends from a time gone by and making new friends amongst our extinct creatures. I worry about the future of these collections and the many friends and colleagues I have working here. What will the landscape be like by year’s end? Will Tom, Carolyn and Bruce be there to help with my requests, questions and to bounce research ideas off? But all is not lost; just like in Episode Four of Star Wars, there is hope. The force is strong. After a string of chief executives with little regard for museum collections and who have forgotten the core purpose of a museum, maybe it’s time for a new one who knows and understands the value of our unique collections. What about a scientist or a historian as CEO…. now that would be a novel move indeed. Why not go further and have a working natural history scientist, a Māori scholar and a historian on the museum board? Like all good conservation and environmental stories, from the Kakaruia/Black Robin (Petroica traversi) to Manapouri Dam, we have to fight to save our taonga from extinction. Time is not on our side though as the Empire is already on our doorstep. Martin wants to have this all wrapped up within the next few weeks. I challenge the Ministers of Arts, Culture and Heritage, Jacinda Ardern and Grant Robertson, to stop this happening on their watch. So, once more into the breach, dear friends, and let’s save Te Papa’s collections: they belong to us; to Aotearoa/New Zealand. #MakeTePapaGreatAgain. Thank you for this article – it clearly sets out the problem and the potentially disastrous consequences of this ill-considered restructure. Lets hope it is not too late to save Te Papa. Without the keepers of the knowledge all you have are artifacts gathering dust, then maybe a cleaner or contractor comes along humming the latest pop song and acting on instruction dumps the lot. To save short term costs? What is the role of a museum if it is not to preserve cultural and natural history for future generations? That means you MUST support and grow and make accessible the collections. This is not a fashion show! It is our heritage. Excellent and well informed analysis of the situation. It is critical that the government gives appropriate and substantial priority to these important scientific resources. New Zealand is seen as being so environmentally conscious. Do not ever abandon your repository of joy of research , learning , brain storming and preserving ! “What about a SCIENTIST or HISTORIAN as ceo?” Surely you are joking Dr Feynman. I am trying to save significant science instrument archeology out here at Gracefield. It is a battle keeping one eye on the cleanouts and one eye on the key of the miniscule office where it is being saved. And are desperate for a display space. Great passionate response to critical issues facing collection management and citation in many museums brought about by head counting audiences ahead of collection care and interpretation. Museums are at a critical point internationally to reestablish their validity to the public, and I’d argue can’t be done without a re-valuing of core practices that stem from keeping collections. I can’t imagine these treasures being lost. Who can possibly be so short-sighted as to consider it? I have spent time in our local Washington State museum’s lower floors, and am acquainted with some of our ancient animals, long since extinct. They are considered important by paleontologists and non-paleontologists alike. New Zealand’s fossils are just as and possibly even more important to save. Don’t let anything happen to them! We view New Zealand very warmly and positively in the rest of the world. We think of it as a sane nation, in a world that is sometimes heading the other way. But this, it truly is insane. Would the Egyptians plow over the pyramids? I doubt it, so why would New Zealand be open to such a short sighted plan that would in essence destroy part of its cultural and scientific treasures? Collections are the linchpin in understanding biodiversity, and change over time. This is crazy. During my career as a marine ecologist, I have used museum collections as teaching materials as well as to investigate species differences that affect their behavior and ecology. DNA analysis the modern catch-all of taxonomy can’t do that. Museum collections are priceless. More importantly, recently New Zealand was party to having the Ross Sea designated a Marine Protected Area, something that elicited much ballyhoo from NZ and global NGOs. To help justify that designation is the fact that the Ross Sea is the type locality of over 400 marine species, more than 40 being endemic to the Ross Sea, the description of which was based on specimens archived and published upon by DSIR. These specimens, descriptions and characteristics of habitat, will be key sources for assessing effects of climate change on the Ross Sea Region MPA. Many of these specimens, I do believe, are archived in NZ/Te Papa museums. Thank you, Nic, for your eloquent and brilliantly argued post in defence of Te Papa’s natural history collections and the dedicated specialist staff who care for them. As someone with a research interest in New Zealand’s science history, I admire, respect and enjoy the fantastic work that you, Alan Tennyson, Trevor Worthy and many others have done and later published on using these unique collections – a great deal of which, as you point out, owes a special debt to collection staff. My own (very modest) research has benefitted greatly from Te Papa’s fantastic archival material – another of its collections that throws much important light on our natural and scientific heritage. I am struggling to fathom the shortsighted top-level managerial thinking behind the planned staff redundancies and – worse – the mooted dispersal of Te Papa’s natural history collections across the country. At a time when politicians have been encouraging us to understand and respect the environment more than ever, has it occurred to the said managers just how badly their proposals might reflect on this country’s scientific reputation and credibility? I was director (CEO) of the Australian Museum in Sydney 1976-1998 and was chair of a Ministry commissioned review of Te Papa in 2000. “An integral responsibility of superior governance and ministerial oversight requires questioning of major decisions by senior management in the context of ongoing refinement of strategic direction. Nothing in the not insubstantial information available to me suggests that this has occurred. Te Papa is one of the most important institutions in the cultural and heritage area of New Zealand and its contribution to understanding the Nation is absolutely vital. Nic Rawlence points this out comprehensively in his blog. Spending millions of dollars to relocate collections from a structurally superior building risks damage to the collections and absorbs huge staff costs for no gain whatsoever. @Des Griffin I suggest wording like “…its contribution to understanding the Nation is absolutely vital” is so obviously an overstatement that it is perhaps counterproductive? Lost Worlds, Vanished Lives is the blog of Dr Nic Rawlence and colleagues in the Otago Palaeogenetics Laboratory. They aim to better promote how ancient DNA, palaeontology and palaeoecology can reconstruct past ecosystems through time and how this new knowledge can improve conservation management of New Zealand's unique biodiversity. 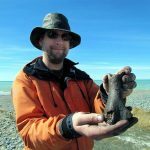 Like what David Attenborough's seminal documentary 'Lost Worlds, Vanished Lives' did for palaeontology, this blog aims to promote ancient DNA 'Time Lord' science to the general public. David Haynes on Are deer the new moa: Ecosystem re-wilding or a flight of fancy?